Our premium stratum corneum rebuilding skin needling kit (derma roller plus scar cream) is recommended for all types of scarring regardless of type and location. The rolling techniques is especially effective for old inactive scarring, hypo-trophic (white) scarring and hypo-trophic (white) stretch mark scarring. The derma roller reactivates the scarred area while our Hyper-Heal scar cream repairs the new active scar. Please call 800-588-7455 or email us. Skin micro-needling (derma rolling) is an increasingly common cosmetic procedure for treating old inactive scars. Our roller is a class 1 medical device which is simple and easy to use at home. 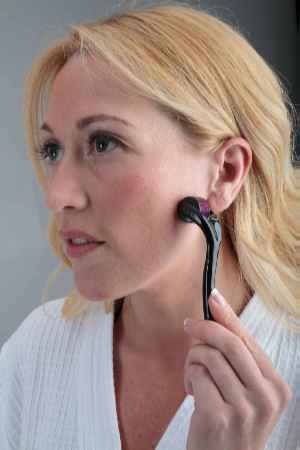 In fact, it has very similar results to Laser Treatment, Chemical Peels and Dermabrasion, but is considerably less invasive (without any of the skin trauma) and carries only a fraction of the cost. Skin micro-needling (derma rolling) is an increasingly common cosmetic procedure for treating atrophic (white) scars and atrophic stretch mark scars. Our roller is a class 1 medical device which is simple and easy to use at home. In fact, it has very similar results to Laser Treatment, Chemical Peels and Dermabrasion, but is considerably less invasive (without any of the skin trauma) and carries only a fraction of the cost. The derma roller perforates the stratum corneum creating a high TEWL (trans epedermal water loss)on atrophic scars and stretch marks. In a sense it re-activates an inactive healing state allowing ReJuveness scar healing products to work and repair of the stratum corneum. The results should be a totally rebuilt stratum corneum and smooth even colored highly aesthetic re-healed scarred area. ( .2 - .3 mm) for increased penetration of scar healing products into the skin. (.5 mm) light scarring, light acne scarring, chicken pox and insect bite scars. (1.5 mm) for more severe cases of deep scars. Do not share your ReJuveness Rejuva Roller with anyone else. Do not use this product if you have open cuts, wounds, sun-burnt skin, active herpes outbreaks, pustule acne lesions, or any other acute infection or inflammation of the skin, have a history of poor wound healing, collagen diseases, blood problems, are pregnant or lactating, are prone to keloid scarring or have diabetes. Aspirin, Nurofen, Vitamin E and blood thinning drugs all cause increased bruising and should not be taken in the two weeks leading up to treatment. For all scar types, hypotrophic(white) scars, wrinkles, stretch marks and damaged skin. A lack of collagen cause these conditions, using a Rejuvenss Derma Roller offers nature a helping hand by encouraging collagen production in the skin, which helps prevent or reverse their formation. The instructions are to be used as a guide to getting your skin needling treatment underway. It is important to understand that while a good place to start, it is likely that you will develop your own routine in terms of the frequency and pressure of rolling. You will find out what suits you best - if you need help at any time contact us via email info@rejuveness.com or phone (800-588-7455) we are here to suggest adjustments and help you get the very best from your skin needling experience. The dermaroller can be used as part of a successful treatment regime for all of the following. There are two recommended methods of using your Derma roller and if you are unsure of how to use them, follow these carefully. We update these recommendations based on the experiences of our customers � whenever the changes occur, we update our web site. Once you have undergone a skin needling session, improvements may continue to develop for several months. Establish a sterile environment, make sure you wash your hands as well as making sure that the body area you are about to treat is also clean. We also recommend that you ensure that the treatment area is clean and free from germs. You may wish to wipe down the area with a disinfectant (rubbing alcohol) or similar. If it is the first time you are using your Derma roller, sterilizing before use with disinfectant (rubbing alcohol). Although most products do come pre-sterilized you should check before use. This is the most common way of using the device - the vast majority of people use their roller in this manner. Using the roller with slight pressure; roll the device back and forth four times in four directions as shown below. The treatment should not be painful and should not draw blood. You will become accustomed to how much pressure you can apply without causing any pain or discomfort. Use the roller as part of your daily routine - you can roll every day if you wish although we recommend allowing your skin at least a couple of days of rest each week. It is possible to use the roller far less often and we suggest that fitting your sessions in with your daily and weekly routine will improve the overall experience. Note that it is not necessary to roll more than once a day. This method involves greater preparation but only requires less frequent use of the device. It is a similar method to that which professional treatments adhere to. Treatments can be carried out whenever you have the opportunity � we recommend monthly treatments although bi-weekly sessions are also fine. When using this method, it is suggested that preparing the treatment area before hand does achieve optimum results. This means applying a ReJuveness scar cream or ReJuveness (Claudio Memory Serum) moisturizer to the area in the days before treatment will ensure your skin is best prepared to begin the healing process once treatment has finished. If you have followed method two, we recommend that after cleaning the area, you should apply an antibacterial cream to protect from any possible infection. (It is unlikely this will happen but it is wise to take precautions.) Apply ReJuveness scar cream or ReJuveness (Claudio Memory Serum) moisturizer after use. Remember that part of the benefits of using your roller is the boost in absorption rates of topical products. Nourishing your skin at this point can reap major benefits. You may experience a slight reddening of the area after treatment. This will fade quickly but dependant on your method, it may last for up to 24 hours. We strongly recommend either staying out of the sun for this period or using a sunscreen to protect yourself. For example - Each morning / night, after showering and washing your scalp, dry well with a clean towel. Roll the Derma roller over the scalp in one direction (and not back and forth). Apply Claudio Memory Serum to balding areas and massage into the scalp thoroughly. If you notice the scalp flaking after a few days, simply rub the dead skin away while shampooing your hair. Treat no more than once per day, 5 times per week. Please take care when using the Derma roller on your face and never use the Derma roller on your eyes or lips. Unless you are disposing your roller after use, when you have finished using the device, rinse it under hot running water. If you have used the roller with numbing cream, stand head first in the half full glass of disinfectant (rubbing alcohol) for approximately one minute. If you only used the roller gently, you need only disinfect the device on a weekly basis. Shake off the excess liquid and stand on a clean towel to dry. Please do not put the device away while it is still wet. When it is completely dry, put the roller away where it will avoid damage. * Never share your Dermaroller with other people. * Do not use a dermaroller on areas of sunburn, open cuts or other sore and tender areas. * Do not us your dermaroller if you are suffering from active herpes outbreaks or any other inflamations of the skin. * You can contact us at any time if you have any questions. * We are not responsible for any unfavourable results which may be derived from improper use of this product. Your skin is likely to redden after use. This should fade within a few hours. In extreme cases, this may last for 24 hours. It is possible that you will experience dryness of skin after rolling. This can be accompanied with some flaking of the skin. If you do suffer in this way, stopping rolling should allow the skin to return to normal within a few days. Please use common sense in these cases - reduce the frequency with which you use the roller and ensure you are using ReJuveness scar cream or ReJuveness (Claudio) moisturizer after use. If still in doubt or the flaking continues, either stop using the roller or contact us for further support.